July 12, 2009, 9am - Boilermaker Post Race Party at F.X. Matt Brewing Company in Utica, NY. Free! July 4, 2009, 4-8pm - Declare Your Independence Tea Party at the City Hall Green in Rome, NY. Free! June 6, 2009, 9pm - Relay for Life Luminary Ceremony at Oneida High School in Oneida, NY. November 14 & 15, 2008, 7:30pm - Skits-O-Phrenia (Director) at VVS High School in Verona, NY. For tickets, please call: 315-339-6279. July 10-20, 2008 - The Robber Bridegroom (Choreographer and playing roles of Airie & Raven) at Bristol Valley Theater in Naples, NY. For more info: BVTNaples.org or 585-374-6318. June 12-22, 2008 - The Musical of Musicals (The Musical!) (performing lead role) at Bristol Valley Theater in Naples, NY. For more info: BVTNaples.org or 585-374-6318. December 23, 2007, 4pm- cancelled - Christmas Concert at the Carlisle Historical Society House! Donations will help with renovations to the house. Corner of 3rd St. & Lexington in Carlisle, Iowa. October 20 & 21, 2007 - Love Is Like... Concerts at Bristol Valley Theater in Naples, NY. Saturday @ 8pm & Sunday @ 2pm. Tickets are $5 for kids and $10 for adults at BVTNaples.org or 585-374-6318. At the last performance venue the show was sold out and the box office had to turn people away . GET YOUR TICKETS EARLY! Broadway Musicals of the 1960s through the 1990s, at Westbury Gardens. Tickets are $10. For more information: 516-333-6807 or [email protected] Westbury is 20 minutes East of NYC. You can get there via train and a 2.5 mile cab ride. July 12-22, 2007 - Man of La Mancha (Antonia) at Bristol Valley Theater in Naples, NY. June 16-24, 2007 - Lend Me a Tenor (Maggie) at Bristol Valley Theater in Naples, NY. June 6, 2007, 7:30pm - Heard the Voice, St. John's Lutheran Choir Concert (Director) at St. John's Church, 502 W Chestnut in Rome, NY. Dessert reception follows. FREE! Sundays, April 15 & 22, 2007, 5pm - Earthly Delights at Emerging Artists Theatre, 311 W 43rd St, 5th Floor. Suggested donation $10, suggested reservations at [email protected] or 212-247-2429, press *1 and include "Earthly Delights" in your request. RESCHEDULED! Sunday, Feburary 25, 2007, 6pm - Love Is Like..., Concert at the ArtHouse Cafe, Rome, NY. Feburary 9-10, 2007 - Love Is Like..., 2 Nights - 4 Shows! Friday and Saturday nights at 7:30 and 9:30pm at the 4th Street Theatre (next to Java Joes), Des Moines, IA. Tickets are $10 at the door or $8 at www.IowaTix.com, Java Joes or ZZZ Records. July 27-Aug 6, 2006 - Sweeney Todd (Johanna) at Bristol Valley Theater in Naples, NY. 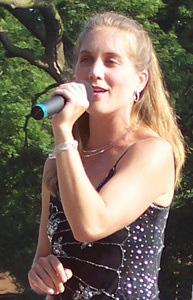 July 4, 7pm, 2006 - Traveling Back Home, Concert in the Park, North Park Bandstand, Carlisle, Iowa, FREE! July 1, 2006, 9am to 11am - CD signing at Moe's Joe Coffee Shop in Carlisle, Iowa. CDs will be available for purchase.